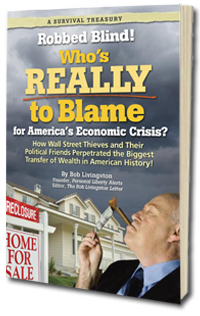 Who's REALLY to Blame for America's Economic Crisis? It has got to be the greatest government cover-up of all time! Wall Street thieves and corrupt politicians carried out the biggest transfer of wealth in American history—right under your nose. And they set off a global economic crisis that wiped out the life savings of a generation... funneled untold billions in taxpayer bailout money into foreign banks... and sent real estate into a downward spiral that can last for decades.